The main guy who did the work was excellent. Very knowledgeable. Also, the different service people, such as plumbers, electrician, floor guy all were excellent too. So happy with the final outcome. Love it! Thank you Luxury Bath! I love my new walk in shower. It is beautiful. Kenny was great and even cleaned up afterwards. I would recommend to all my family and friends. I just love my new bathroom! Money well spent, I am so glad I got it done! Product is great and so are the people! Kenny was very nice and very professional. That being said we were told it would only 3 to 4 days to complete the job and it took 2 weeks. In Kennys defense it was a really big job and i don't believe anyone could have done it in 4 days. I love my new bathrooms. Kenny did a wonderful job. Thank you. 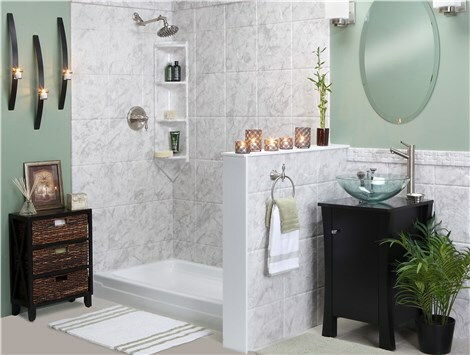 Luxury Bath of Texoma Review by Kathy B. Luxury Bath of Texoma Review by Barbara H.
Our installer, Gus, was fantastic. He was polite, professional, and he took his time to get everything perfect. The salesperson, Daniel, was also polite and professional and spent time in our home and on our store visit answering questions and making sure all the details were correct. Everyone at Luxury Bath was great! Luxury Bath of Texoma Review by Karen B.